A big bricks-n-mortar smokehouse from the cult street food vendors. About time, too. 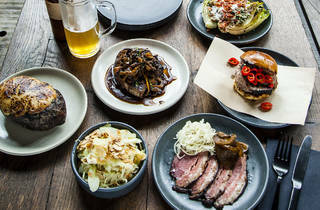 Having built a cult following for its smokehouse meats, street food supremo Smokestak has done the decent thing, opening up a restaurant proper. And a proper restaurant it is: 75 seats inside, 30 more outside. 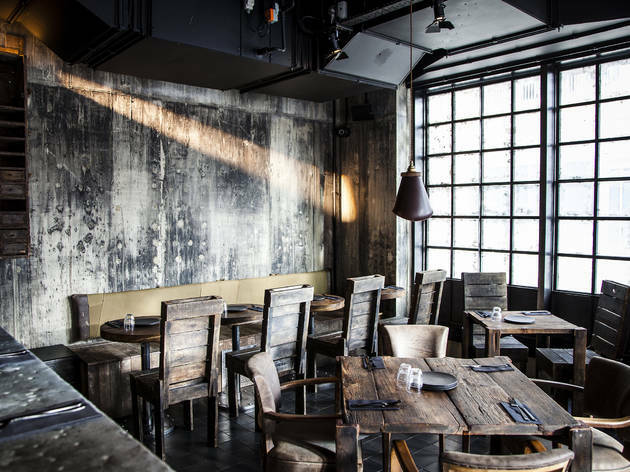 A stygian, semi-industrial space with a hum of throbbing beats, it’s like eating in a medieval nightclub. Keeping with the medieval theme, it was – on the night of my visit at least – dominated by men. Not in a lads-lads-lads kind of way, calling us wenches and slapping our bottoms, but more of a bring-the-boys-for-a-night-of-bromance kind of shizzle. Tables and booths were taken up with bearded thirtysomething blokes, supping on craft beers and cocktails: all part of the man-tastic, meat-lovin’ vibe. At one stage, I saw two fellas do a tiny fist pump (too cute!). Turns out, they’d just found the beef brisket on the menu. This is a signature dish and rightly so. It comes two ways: a single hunk of flesh, or shredded, in a bun. I prefer the latter, which I first ate at Meatopia (a three-day festival of meat), where it was one of the ‘must-try’ dishes, with a perpetual queue. It’s equally the sine qua non of eating here. Moist, smoky, sweet and salty meat (the brisket is smoked overnight, for 12-14 hours, over English oak) comes snuggled inside a pillowy, slightly sweet bun, brushed with a lick of barbecue sauce and bone marrow butter. It also has a scatter of pickled fresh red chilli, with just the right amount of both tang and heat. Price? A fiver. That’s scandalously good value. I also approved of the simplicity and restraint of the pastrami: just four slices carved from a brine-cured, hand-rubbed, house-smoked slab of brisket. Here, the smoke is more subtle, as is the sweet-salt balance; there’s a deliciously fatty rind you should definitely eat. 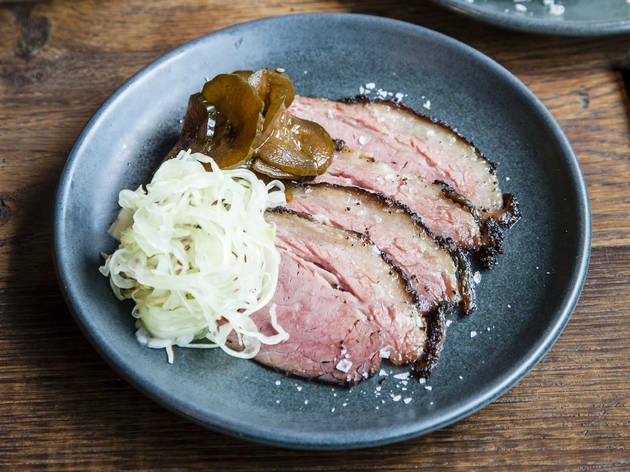 Plus slices of classic sweet gherkins and a fresh, crunchy ‘sauerkraut’ of lightly pickled, still-crunchy cabbage and fennel, spiked with caraway seeds. Garlicky wild mushrooms are cooked in bone marrow: the sticky, unctuous pile is served over beef dripping toast. Don’t take a vegetarian, basically. Or, in fact, a pescatarian. You could technically order fish, but as the two guys next to me scoffed (when I innocently asked if they’d consider it), ‘Why would you?’ Indeed, the biggest thumbs-down of the night was an unpleasantly strong-tasting mackerel (I sent it back; it was instantly struck from the bill – a big tick for service, at least). But a bigger issue is this: every dish comes laden with ‘smoke’, or calories, or both. Choose carelessly, and you’ll end up with an exhausting, ‘one-note’ meal. A baby gem ‘salad’ arrived under a blanket of grated cheese and sour cream. An ice cream arrived unpalatably smoky (enough already! You have your own smoker. We get it). 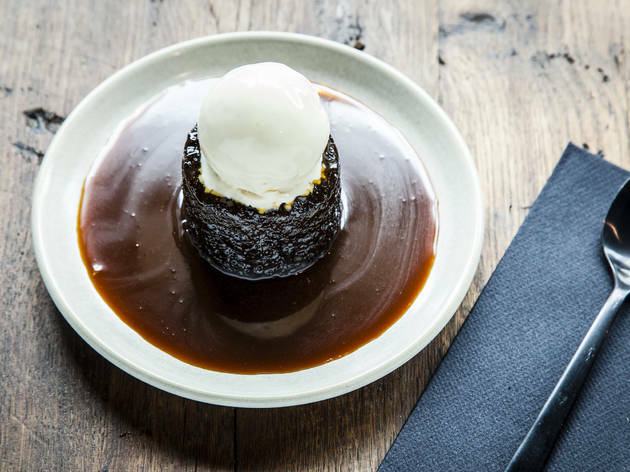 The sticky toffee pud is insanely good, but may just push you over the edge. So go hungry – and I mean, caveman hungry – and order plenty of the citrussy fennel and celery slaw. 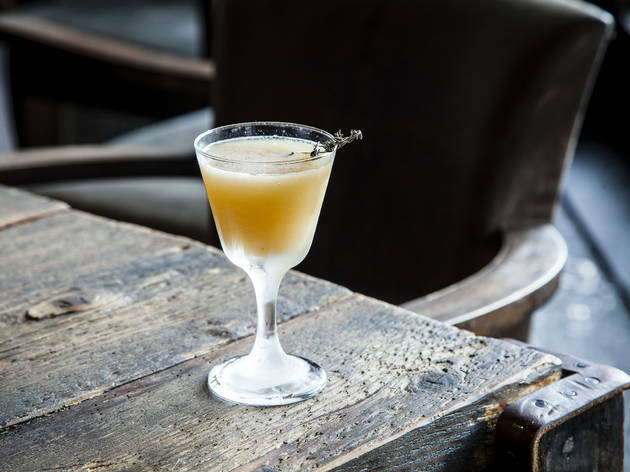 A palate-cleansing yin to all that meaty yang, it’ll allow you to appreciate what Smokestak does best. Dinner for two with drinks and service: around £80. Mon-Sat midday-3pm, 5.30pm-11pm; Sun 5.30pm-11pm. 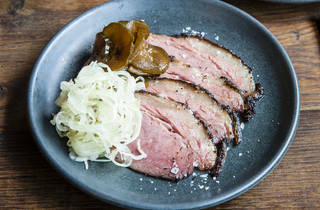 I'm the kind of Flexitarian that has a deep appreciation for meat as a treat and meat cooked with care, Smokestak's reputation had meant that I was eager to cross it off my list for a good few years before I finally made it inside the ominous doors. The heady smell and the dark, weathered decor all lend themselves toward a building of desire for charred & pink goods. 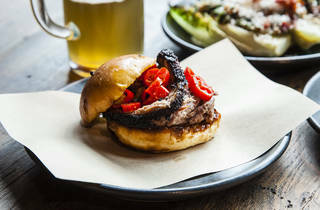 The seasonal lamb rib with burnt apricot whet the appetite for Smokestak's famous Brisket Bun; a sucker punch of potently flavoured, tender beef topped with pickled red chilli and cushioned by a soft brioche bun. This really is a place possessed by the call of the Grill - even the 'Greens' we ordered were charred. 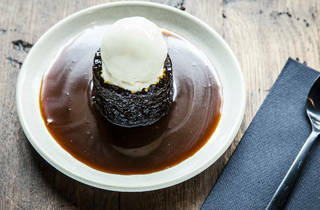 The fact that I felt a touch queasy for 24 hours at the behest of this meat-lover's paradise I think says something about the irresistible nature of the sharing menu between only two and quite possibly my naïve decision to order the Sticky Toffee Pudding despite this. Indulgent doesn't quite cut the mustard, but the Pastrami sure did. The meat at this place melts in your mouth, thats all that needs to be said. Stunning! Went here on a recommendation, the food came quick the staff was great and the vegetarians said they enjoyed their options too. Going back as soon as possible. That beef brisket!! 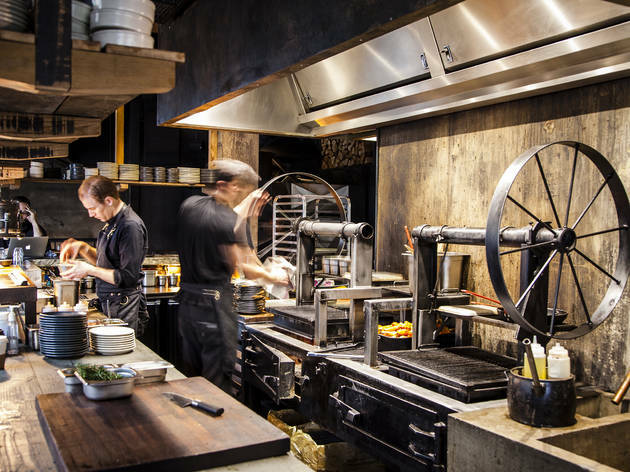 Smokestak is one of those secret places that you can easily miss if you don't know that it is there. A very tiny sign on the street and blurred windows only let you understand that you are actually at the right place. Once inside and if you manage to get a table (try to book if possible, we got lucky that they found a table for us two but we were right next to the toilets so not ideal), you will be rewarded with one of the best food I have experienced in Shoreditch so far: the perfectly cooked beef brisket steals the show, pair it up with that baby gem salad (cream and cheese on top to make it interesting) and you are good to go! A must-try! I read about this place years ago in TimeOut, and immediately ripped the review out and stuck it on my fridge to remind me to go... I finally went a few months ago with a fellow meat-loving friend and well, just the smell when we opened the door (once we found it... we walked by it a few times...) was enough to draw us in! I was dying to get my hands on their peach old fashioned - and when I did, it was sooooo gooooooood. But let's talk about the real reason we're here, okay? THE MEAT. Oh my goodness, it was delicious. Smoked low and slow and just falling off the bone on those ribs, the oxtail was INCREDIBLE, the sides were really great too! The only downside is that my friend and I found it rather expensive for the portion sizes. 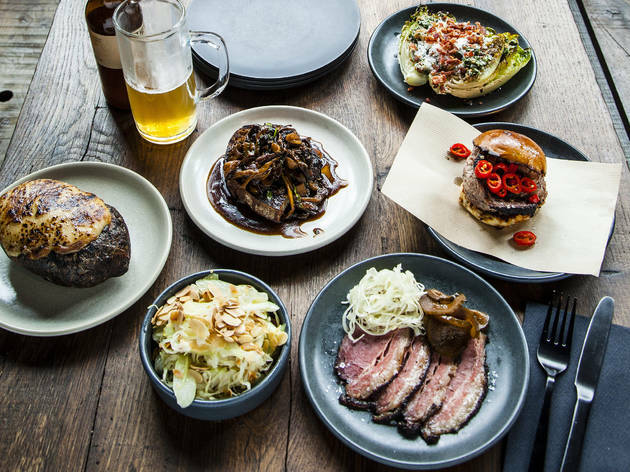 Smokestak is to meat-lovers what Mermaids are to sailors: irresistible and dangerous! Irresistible because just by walking nearby you feel the need to stop by, hearing the soft melody of trendy East-enders drinking craft beers on wooden tables, and being bewitched by the smoke and bustling, industrial-like atmosphere that emanate from the inside restaurant. Dangerous because the open kitchen and barbecue smell (and the waiters too) urge you to try more than one dish, which yet would be well enough even for an angry stomach. No matter what you chose, the meet is always of great quality: pork ribs, pigtails, cheek ox, beef rib, etc. Don’t forget that it is a smokehouse, in other words expect barbecue sauce and fat in almost every plate. If you can’t resist the temptation of trying different meats, at least prefer the fennel to the jacket potato as your side! Excellent cocktails in the basement bar otherwise, the plum sour is a must try, but maybe on a separate occasion. I have to say I nearly cried when I saw they were opening a proper restaurant, being a HUGE fan of their competent mobile grill. Seriously, the way they treat meat here should be studied by mankind. Everything is packed with flavour and has that satisfying melt-in-your-mouth quality that is just irresistible for a meat lover. 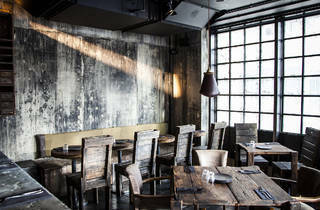 The place has the expected industrial decor, and takes the experience further with starters like the most moreish mushroom and beef dripping toast EVER. 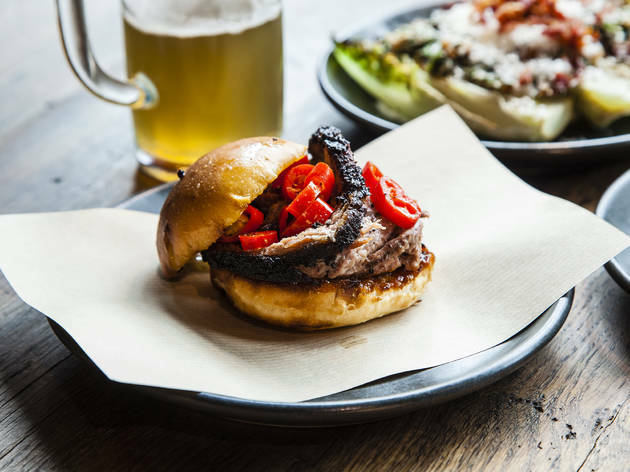 The brisket sandwich perfectly matches coming-apart meat with a sweet bun and a chilli pickle that just elevates it to perfection. Mains do not disappoint, but you have to ask for sides and portions are not huge, which does not make for the cheapest of experiences. But we're talking art here, so I would say it's well worth the splash of ordering a few things for the full experience. To get better, only if they add draught beer to their already competent artisanal bottled beer selection. If you like meat, drop everything and go. Today. Best restaurant in London for us!!! Brisket, ox cheeks, grilled potato, delicious ribs and you cant go wrong... We seriously cant get enough of it! London is becoming a victim of its own success. I have been wanting to try Smokestak for quite a while now (the smells alone are cruel when you pass by outside) but between then and now I have tried other BBQ places in town (Texas Joes near LBG, Bodeans at Tower Hill, Dukes in N1, HotBox in Spitalfields) and the therefore my expectations were even higher. First off--- wonderful staff. Walked in with no reservations (a death knell at times in the area) but got seated at the bar no worries. Their Peach Old Fashioned was incredible, it tasted like a peach iced tea, which is, of course, dangerous when you only want one. We shared a plate of brisket, pork ribs, baked potato with rarebit, and some charred greens (which although was not stated on the menu had nuts on it, so just beware!). The brisket definitely won on the meat front. Deliciously tender and paired wonderfully with the chilis and BBQ sauce it came with. However, only two slices for £9.50 is a bit (pardon the pun) cheeky. The porks ribs (again two) were good but the brisket was the clear winner. The pickles that came with it though were fantastic. The sides were a definite highlight. Don't get me wrong I love me some chips with a BBQ, but Smokstak offers more innovate (dare I say adult?) sides which tickle the tastebuds. The baked potato was fabulous and very large so no qualms splitting it. The vegetables were a refreshing accompaniment, helping to offset the heavy meat and starch which is normal in BBQ places. The issue is now with the deluge of BBQ places in the area, which one to go to? I suppose it depends on the type of BBQ you like. 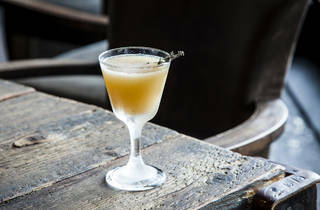 Smokstak wins on their innovative cocktails and sides, but for value not sure they match Texas Joes or Hotbox. Ugh. The struggle is real my friends. I recommend you come here yourself and make your own opinions. Suggest having an old fashioned whilst you deliberate. Once you initially get your head round the fact the decor looks like a torture dungeon, and you keep telling yourself it is just an incredibly industrial look, you will be fine. The food speaks for itself, they really have nailed this place. Definitely not a restaurant you would want to sit in on a warms summer evening, so pop down there whilst you can still enjoy a cosy dark atmosphere inside. We had an incredible meal we ordered to start too share their signature brisket bun with pickled chillies, do not be too alarmed with the amount of red chillies you see, the pickling process takes a lot of the heat out. I would recommend if you are sharing to have a large brisket bun £8.00 completely delicious, accompanied by the baked beetroot, goats cheese and hazelnut salad, great combination and start. For the main course we shared the thick cut pork rib with pickled cucumber, £9.00 cooked to perfection, fell off the bone beautifully smoked and marinated, the celery almond preserve lemon slaw which had a very contrasting but complimentary fresh and crisp taste, as well as the jacket potato smoked rarebit, very cheesy and heavenly. Finished up with the salted caramel ice cream and washed down with a bottle of Rioja. The bill was a very reasonable £40 a head. The staff were very helpful and lovely, we popped in early Saturday evening without a booking and ate at the bar, great experience all round the place was heaving so they are obviously doing something right. Would definitely recommend booking on the weekend. The food here is refined. That the plates look elegant does not by any means take away from the big but balanced flavours or generous servings we associate with BBQ food. 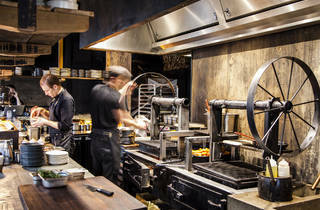 Smokestak is simply delicious and has great atmosphere and buzz about it. Particular highlights were the crispy pig tails, thick cut pork ribs (as good if not better than their street food days) and surprisingly the vegetarian smoked aubergine dish. For 2 people with a glass of wine we paid just over £60 and both came out stuffed (and I eat big). Really good value, and cant wait to go back to try the rest of the menu or, as I saw it, the checklist...and I have to mention the smoked ice cream....see I cant stop talking about the food here!